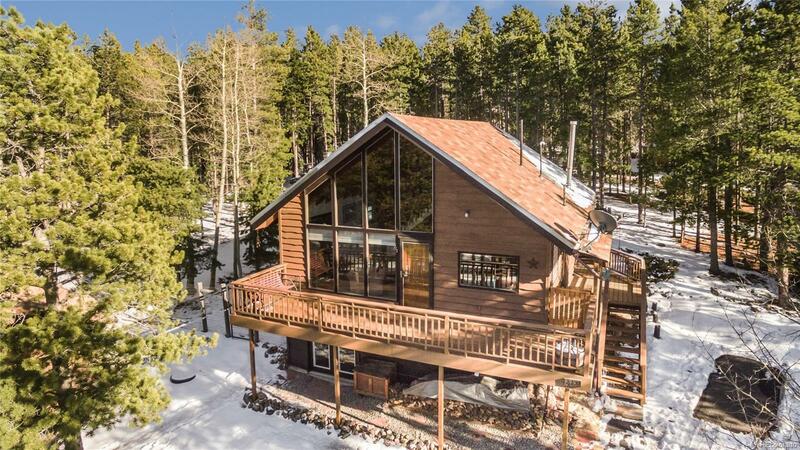 This cozy mountain home is surrounded by pines, affording you privacy while still allowing for lovely views of the surrounding mountains. The living area has a wall of windows that brings the outside in and provides passive solar. Vaulted tongue and groove ceilings and wood-burning fireplace in the living room create a warm and inviting atmosphere. The kitchen has granite counter-tops, updated back splash and newer appliances. Above is an open loft thatâs perfect for a home office or gym. The master bedroom is on the main level with French doors that open to the back deck. The bathroom has been tastefully updated and youâll enjoy the natural light that pours in from the skylight. Down in the lower level, youâll find a large living area with a full bathroom, wood-burning fireplace and French doors leading to the front yard. With plenty of deck space for soaking in your surroundings or entertaining loved ones, this delightful mountain retreat is the perfect place to relax and recharge.